A blog about traveling across the USA in a tiny house with a cat and dog, having daily adventures, and living a minimal and free life. I left New Orleans around 2am after eating one last big, fat, juicy sandwich at Verti Marte (a super delicious deli on Royal St. and a must for anyone that likes good food). I drove until I felt like I needed a nap which was around 5:30am. 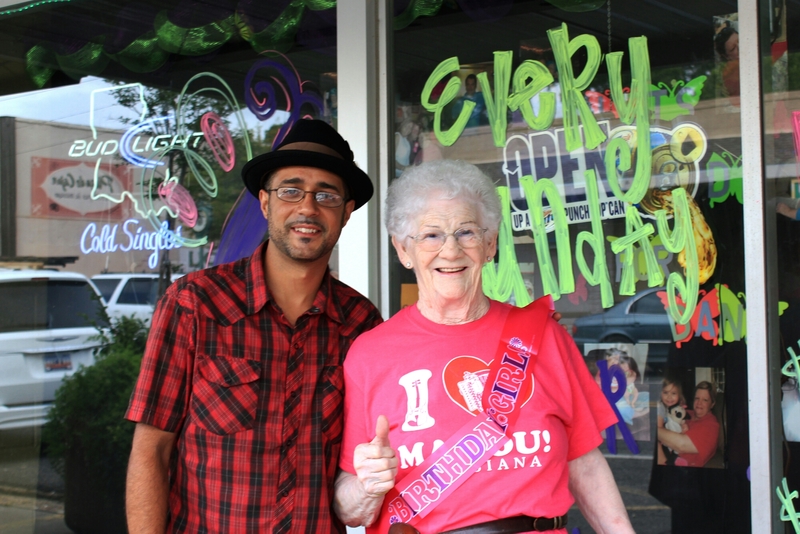 I got up by 9:30am and I made it to Mamou a little after 10am Saturday morning. 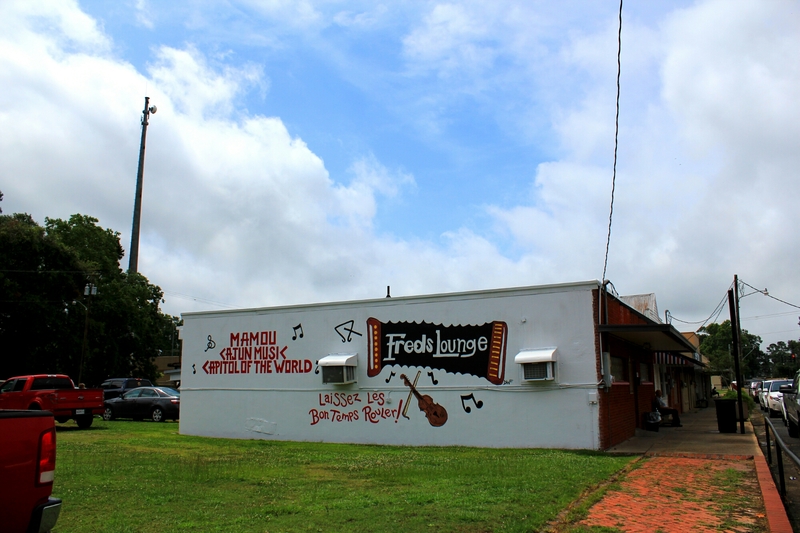 I found Fred’s and before I walked through the door, I could hear music going as I walked up. Once inside, I could see the action was in full swing. 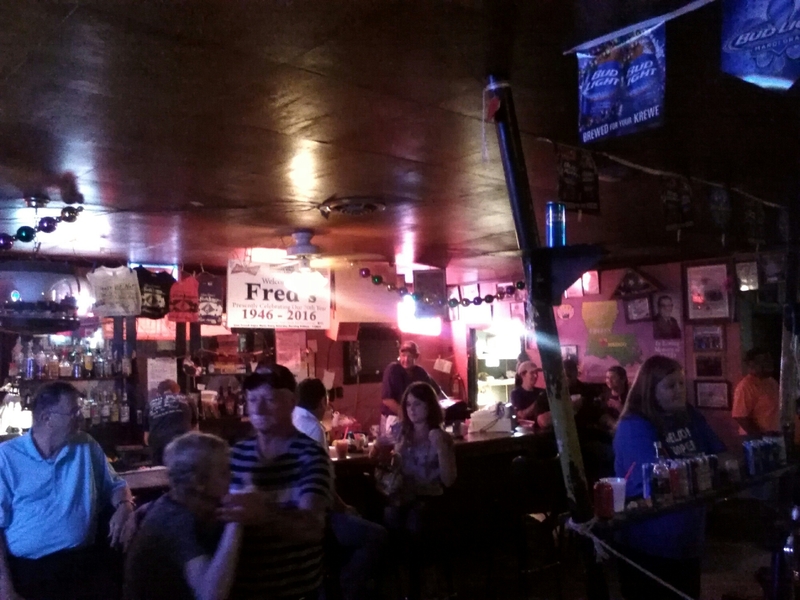 The appearance is a lot like most any small bar, dimly lit with photos and local nostalgia on the walls and a casual but hoppin’ atmosphere. Ordering a bloody there is like a right of passage, so, I had one and it was quite good, pricey of course, but it was good enough to get a second one before I switched to MGD. There was a band playing and plenty of people and couples dancing; mostly folks a few generations older than I. There was also an old lady walking around with slices of boudin for people (a tradition originally held by Sue before she was let go). A conga line even broke out for a while. At one point a woman invited me to dance with her so I obliged. It’s hands down the most lively bar scene I’ve ever experienced so early in the morning, and they’ve been doing it for 70 years. The whole thing is aired on a radio show as well, which has been done almost since the place opened. The whole time I was looking for Tante Sue. I didn’t know exactly what she looked like but that she had white hair and is a fairly old woman. Eventually I went outside to check on my dog and I met a guy who told me it was Sue’s birthday, and there was supposed to be a party. After I walked back to the entrance to Fred’s I ended up talking to another man who was sitting outside on the bench. 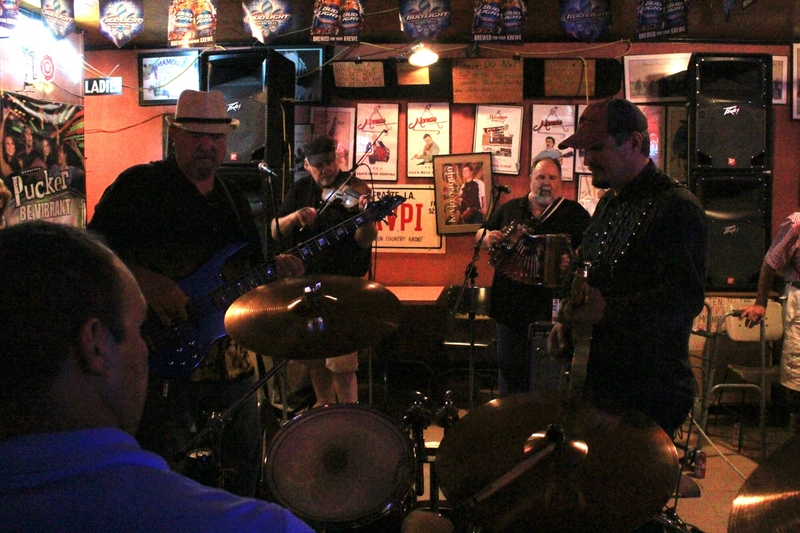 We talked about my trip and where I’m from and he told me about some of the really good local Cajun musicians, and how the band that was playing was more like rock and not true Cajun. I mentioned that I was hoping to see Sue and he informed me she worked next door and wasn’t at Fred’s anymore, and, at that very moment he pointed her out since she was literally just about to walk into the bar next to Fred’s. I excused myself and hastily walked up just in time to open the door for her and walk in with her. 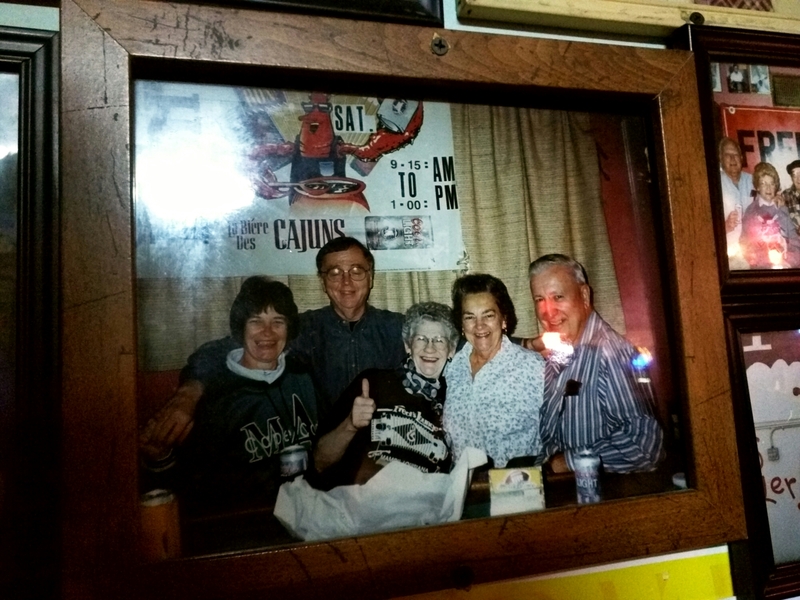 We talked about how I discovered Mamou, how I heard of her, and that I was glad to meet and talk to her. 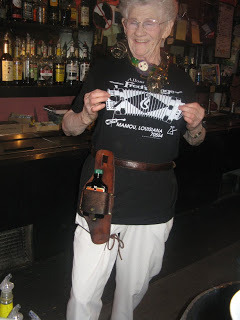 I wished her a happy birthday and then we got a picture taken, but only after she strapped on her leather holster custom made for a bottle of hot damn. It was her 85th birthday. Since I heard she wasn’t at Fred’s anymore, I had to ask about it. Apparently she was fired after being there 69 years. Kind of a bitter end. The place came under new ownership quite a while ago, and Sue was part of the deal, but at the beginning of 2016 they decided they didn’t want her there any longer. Anyway, the experience was different, interesting, and a lot of fun; I met some good people, heard some good music, and I’d recommend it to anyone passing through the area. 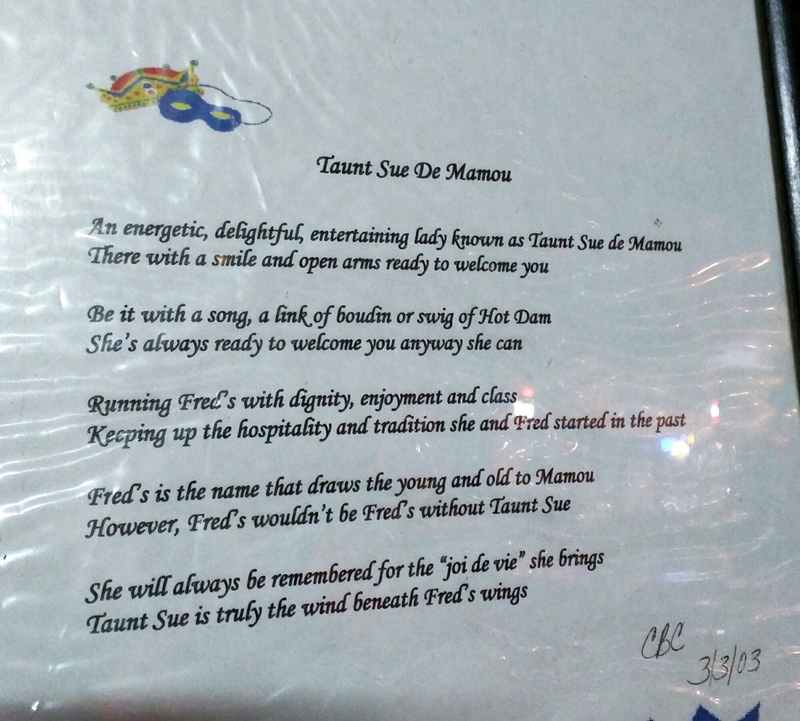 This entry was tagged Cajun music, Fred's Lounge, Mamou. Bookmark the permalink. I have noticed you don’t monetize your blog, don’t waste your traffic, you can earn additional bucks every month.